WE HAVE GRADUATED! : UCSI University graduates throwing their mortar boards in the air after the university’s 26th Convocation Ceremony. An Indoensian student studying at UCSI University was honoured at the university’s 26th convocation ceremony for putting a career in showbiz on hold in the name of education. Having made his name as a teenage poster boy, Raden Muhammad Fajjar ,20, had numerous opportunities to model in Indonesia and he was selected as a brand ambassador for a major car company. However, Muhammad Fajjar turned down the offers to focus on his studies. “I was 18 then and taking up those offers would delay my studies considerably,” said Muhammad Fajjar who graduated with a Bachelor of Arts (Hons) in Mass Communication. “I have no regrets whatsoever and studying at UCSI University was one of the best decisions I made in life. From thought-provoking classes to the rich cultural diversity on campus, my experiences at UCSI University will provide many fond memories. encouraged his peers to pursue their passions and make a difference in the lives of others. An active debater and public speaker, Muhammad Fajjar pursued his affinities during his studies and he was selected as the Tourism Ambassador for Batam City and the province of Riau in 2012.
excelled in news reporting and emceeing events. 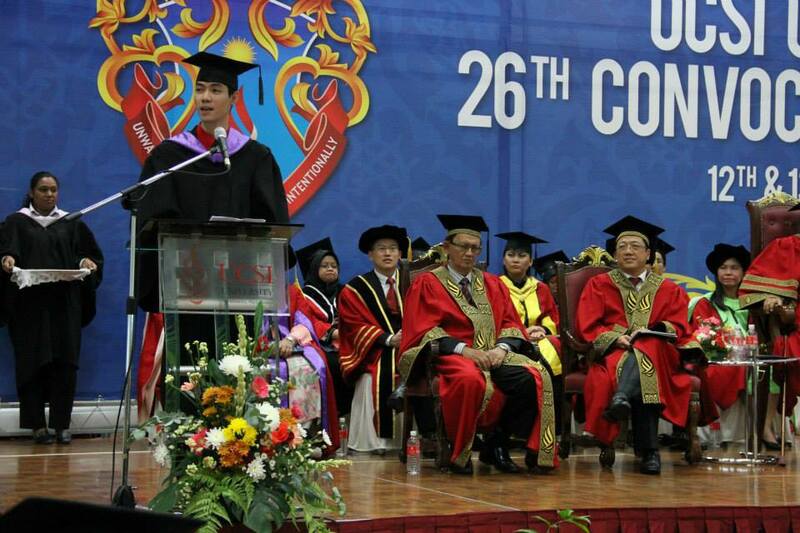 The graduation ceremony also stood out as the first convocation UCSI University vice-chancellor Prof Dato’ Dr Khalid Yusoff presided over. A renowned cardiologist in Malaysia, Prof Khalid was recently appointed as UCSI University’s third vice-chancellor. “Be profoundly aware of ways you can contribute in your workplace, your family and your community,” he said in his address to the graduating class of 2013. UCSI University has released its Trust Scholarship Awards for 2014 and SPM 2013 students may apply using their SPM Trials. Note that the deadline for application is on October 30, 2013 for the A-Levels and Pre-University programmes for January 2014 intake. Please contact EduSpiral Consultant Services or whatsapp us at 016-331 8431 for the Scholarship Application Form.